I’m grilling flank steaks — nothing fancy, but I had to think ahead and marinate them overnight. 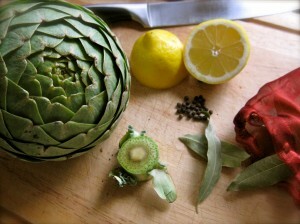 The artichokes are looking quite tempting in area groceries, and when I make artichokes, I also plan ahead. 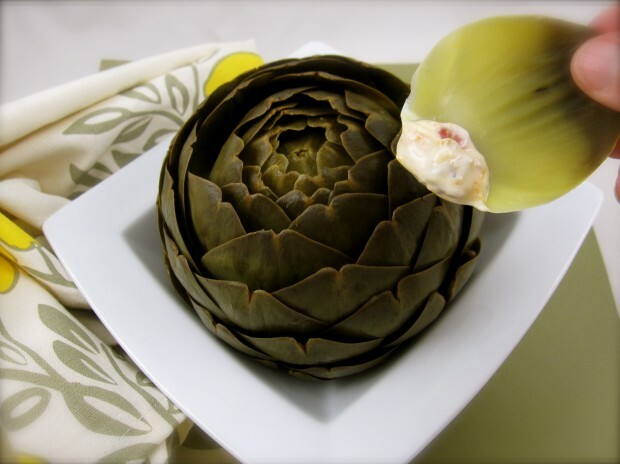 The following recipe is a bit quirky; I’ve never seen or heard of anyone preparing them like this, but it is quite simple and yields an incredibly tender and flavorful artichoke. There are dozens of methods for steaming artichokes, but I keep returning to this. The secret is cooking them until they are just about tender (the leaves wiggle when you pull them but don’t easily pull off), then turning off the heat and leaving them to soak in the cooking water, covered, four to eight hours. Sounds a bit heretical, I agree, and I discovered this “technique” by accident: I forget to refrigerate artichokes one night before going to bed. The next morning I woke up to incredibly aromatic and tender artichokes, the flavor of the bay leaf and lemon permeating the leaves. You could trim them, but they were so lovely I didn’t bother. Place artichoke(s) in a large pot and cover with salted water. Squeeze lemons into the water adding the squeezed lemon as well, peppercorns, and bay leaves. Bring to a boil, covered, then reduce to a simmer. Cook a good hour or more until you can wiggle a leaf, but it doesn’t leave the choke easily. Turn off heat and let sit 4-8 hours, covered. Combine 2 parts mayonnaise to one part tapanade and serve with the artichokes.